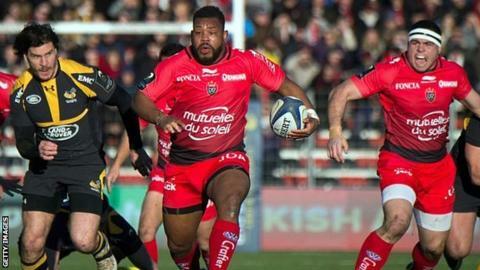 Former England flanker Steffon Armitage is to leave Toulon and join their French rivals Pau, ruling out a return to the national side. RFU rules stipulate players must play their club rugby in England to be eligible for international selection. Armitage, 30, had been linked with a return to England after Wasps showed interest in signing the former European Player of the Year. He won five England caps in 2009-10 but has played in France since 2011. His departure from Toulon ends a trophy-laden spell with the star-studded side that included three successive European Champions Cup titles. His consistent excellence in their back-row led to him being voted Europe's best player in 2013-14. Despite pressure on English rugby's governing body to relax its selection criteria after England's poor showing at Rugby World Cup 2015, the RFU extended its policy to prevent an exodus of leading players from the domestic game. Armitage's brother Delon - who won 26 caps at full-back for England before similarly moving to France in 2012 - is also leaving Toulon, but to join Lyon.